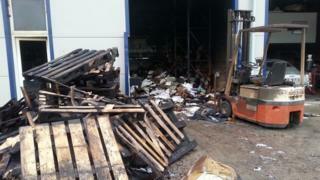 A fire has caused significant damage at a paper bag storage facility in Wiltshire. The blaze at Paperbagco on the Northacre Industrial Park in Stephenson Road, Westbury, broke out just before 21:00 GMT on Monday. A Wiltshire Fire and Rescue Service spokesman said the fire was now under control. It is understood nobody was injured. The company said the damage was contained and it can continue to trade.